It’s amazing how at birth most babies are of similar length yet, by the time they reach adulthood the differences in height are considerable. Parents often wonder how tall their toddler or preschooler might be when they grow up. Grade-schoolers and young teens may ask, "How tall will I be?" 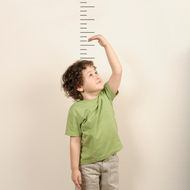 It is a natural question for parents and children, and besides being a little fun to try and predict how tall a child might be, pediatricians also find it helpful to make sure a child is growing as expected. Factors That Affects Your Child's Height? Nutrition: A child who is overweight is often taller than classmates, although that does not necessarily mean that he will be taller as an adult. Children who are very underweight might be shorter than expected for age. Hormone imbalances, such as low thyroid or growth hormone levels, lead to slower than expected growth and can result in children who are either shorter or taller than would be expected if not diagnosed and treated. Review red flags to help you tell if your child is growing normally and will reach his predicted height or if he might have a growth hormone problem. Some medications, particularly chronic use of corticosteroids (like prednisone), can slow growth. Children with some chronic illnesses, such as severe arthritis, untreated celiac disease, or cancer may be shorter than expected. Children with some genetic conditions can cause either short or tall stature. For example, those with Down Syndrome, Noonan Syndrome, or Turner Syndrome tend to be shorter than other family members, while Marfan Syndrome can cause someone to be taller. How is a Child's Adult Height Predicted? Take each parent's height in centimeters & add them together. Divide that number by 2. Add 6.5 cm to the number. This number is the mid- parental height for boys. This number plus or minus 10 cm. is the range in which you could expect your son to fall. Take each parents height using cm. & add them together. Divide that number by 2. Subtract 6.5 cm. from the number. This number is the mid-parental height for girls. This number plus or minus 10 cm. The range in which you could expect your daughter to fall. So, say you are a women of an average height of 162 cm & your husband is 193 cm. Then you can expect to have a son who grows between 175 cm & 195 cm. & for a girl, she would be between 162 cm & 182 cm. Nutrition has an effect on how our body forms & grows. So at crucial growing phrases in the early years our bodies need the right nutrients to fulfill long term growth potential.